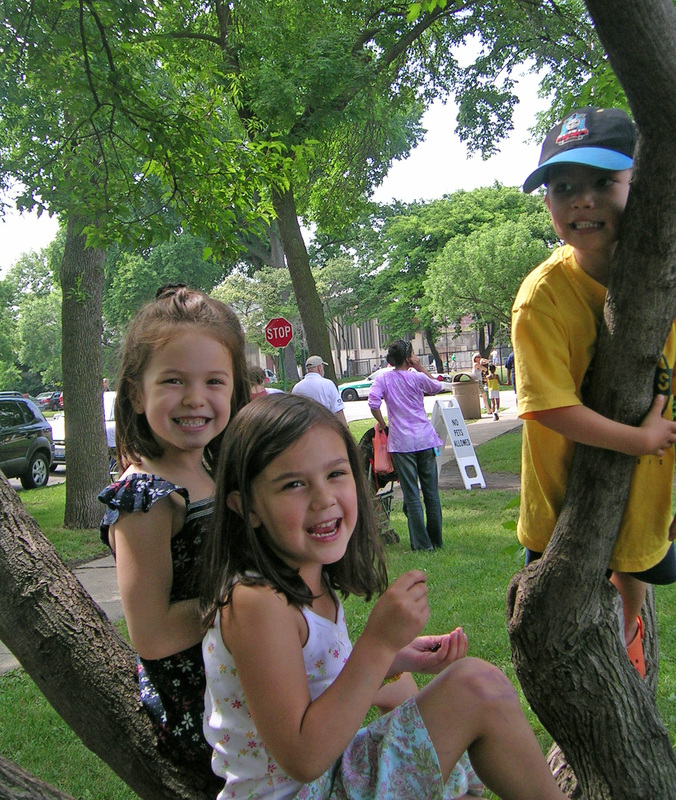 There is a tree on the parkway next to our three-season farmer's market here in Oak Park that means a lot to our family. It is an Elm with low, accessible, sturdy branches near its base and midsection. These branches are open arms, welcoming waves of climbing children on Saturdays from mid-May to the end of October. Our kids are mostly grown now, and we don't make a regular family affair of the farmer's market anymore. This decade-long family ritual has been supplanted by our teens' work schedules and the business (busyness) of other commitments. Our farmer's market Saturdays are now quicker-hits where one or another of us will swing by to pick up height-of-season blueberries for a recipe or plump heirloom tomatoes for a potluck, and sometimes linger awhile to talk with friends, or listen to the farmer's market bluegrass band, or stand in (the long) line for a box of still-warm donuts. I remember how, in those years, the sturdy-branched Elm would drip for hours with strawberry-mouthed children, who would dangle their plump or gangly arms in rest -- suspended, belly-side down, on a branch beneath its umbrage. I could sense its weary joy at being hugged around its low waist by little arms and hands, clasped together as a ring around a rosie. I could sense the satisfied sighs in its perennial role as a steadfast fixture of this Saturday ritual for so many months of the year, for so many seasons of time, for so many waves of families with climbing, berry-munching, contented kids. The years have ceded my own children's places inside the trusty branches of this generous Elm to a new generation of Littles, and I must smile wistfully and gratefully when I pass and see it standing guard or boughs bending slightly from so many little feet. It reminds me that despite the astonishing passage of time and the quickening evolution my own dear family -- our Elm, like its sibling trees, like its mother and father trees, render us (turn turn turn) a blip in the life of a tree, in the design of the land, in the systems of our Earth. There is comfort in being held by that thought; there is comfort in having been held by that Elm.